Friday (set up and sales) Noon - 5:00 p.m.
Sunday 7:00 a.m. - 4:00 p.m. The Fortuna Redwood AutoXpo Swap Meet and Classic Car Show is held once a year in Rohner Park in Fortuna, California. Hundreds of classic cars (many for sale, some just for show) from all across the country are displayed by their owners on Main Street on Saturday. 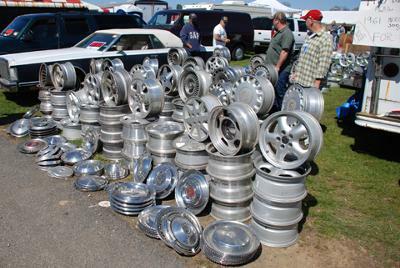 The Fortuna Redwood AutoXpo Swap Meet draws spectators from all across Humboldt County and California to shop for hard to find car parts and accessories. Don't miss an opportunity to come to our classic car events and swap meet. Mark your calendar now! Come to buy, come to sell or come to look. Bring the whole family for a great day!